Michael Noonan says he “shares the outrage of the public” on bankers pay, but there are “legal constraints” in tackling it. Bank of Ireland's flagship branch on College Green: 24 staff at the bank are on salaries of over €400,000 a year, Michael Noonan has said. 24 STAFF at Bank of Ireland – which has received €4.7 billion in State aid – are paid salaries of over €400,000 a year, the finance minister Michael Noonan has revealed. Noonan told the Dáil this evening that 193 staff at the bank, in which the State owns a 15 per cent stake, were on salaries of over €150,000. Of those, 109 are on over €200,000 a year – the pay cap for civil servants – while 43 are on over €300,000 a year. The figures were supplied in response to a parliamentary question by Sinn Féin’s Padraig Mac Lochlainn. 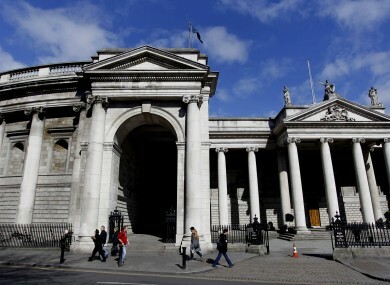 Noonan said the figures had been supplied by the bank itself, and were correct as of March 31, 2011. “The government shares the outrage of the public concerning these levels of remuneration,” Noonan said. The minister pledged to “explore any avenues and options” to address the pay, but said he was subject to several legal constraints – including a constitutional clause guaranteeing property rights to individual citizens. Sinn Féin’s finance spokesman Pearse Doherty challenged the minister on his plans, claiming that the government was only looking to cut wages of bankers after public outcry and not on its own initiative. Noonan countered, however, acknowledging that the “level of salaries provided to certain bankers is outrageous”, and denied Doherty’s claims of a delayed reaction. Noonan also admitted it was “an obscenity” that some bankers who had “participated in the destruction of the economy” were insulated from the effects of that collapse simply because they had already retired. Earlier, Noonan had said the auction of 4G mobile phone bandwidth – which raised over €855 million for the State, with €482 million to be paid upfront by Ireland’s four mobile operators – would mean higher-than-expected government income for 2012. He said, however, that the Budget would still continue with the €3.5 billion of adjustments as previously planned. Email “24 staff at Bank of Ireland earning over €400k a year”. Feedback on “24 staff at Bank of Ireland earning over €400k a year”.